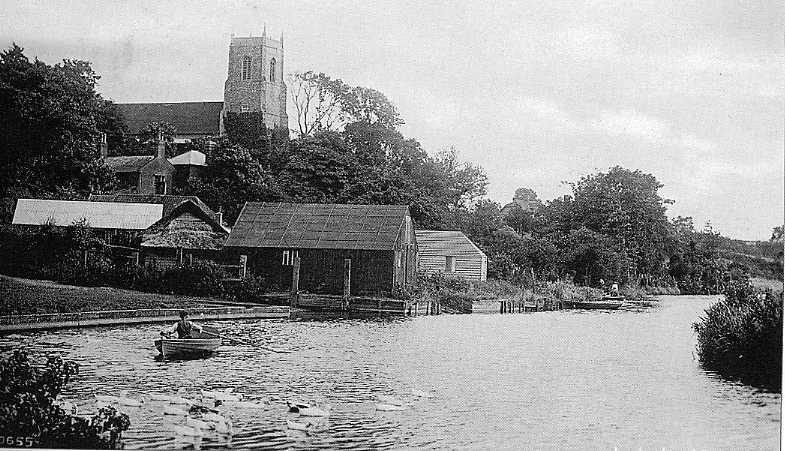 Belaugh (pronounced 'Beeler') is a fascinating little village which lies on the River Bure between Coltishall and Wroxham. A narrow, steeply sloping lane leads up from the river to St Peter's church which stands on a hill overlooking the surrounding Broadland. This church has a special significance because it provided the inspiration for John Betjeman's life-long interest in church crawling. He first encountered it as a boy when he came to Norfolk for family holidays. To the bored tourist 'just another church'. A soothing sight to mariners at sea. The programme, which was directed by Edward Mirzoeff, was Betjeman's tribute to the Church of England and featured many churches in the Norwich diocese including: Cley, Booton, Bressingham, Bylaugh and Sandringham. Originally the church had a lower thatched roof - as depicted in J.B. Ladbrooke's lithograph of 1822. Inside there is a very fine rood screen (for such a small parish) - depicting 12 saints.